I learned a few things while living on the road these last fifteen months. They are simple things that I think I’d learned previously but had forgotten. That is one thing travel does well, it shifts the course of things if you let it, revealing both old and new. The sun comes up in the morning and goes down in the evening. Likewise, the day will pass of its own accord. These things occur naturally regardless of one’s plans. While traveling, I found myself frequently summarizing, “Well, another day that took care of itself.” Travel without an agenda is liberating this way. It is less an experience of managing a day and more a realization of the day’s flow. I wish to make my life more flow, less managing. Travel days were best when we did something, but not everything. We did less, but we did it better. It falls into the realm of better understanding one’s nature. If you have some insight into your nature, exploit it. You don’t have to swing for the fences every time, but nurture what works for you. We fell into a natural rhythm on this trip, a gentle flow of following our curiosity. I wish to make my life less wide, but deeper in this way. We spent a good bit of time in rural America, on back roads and in little towns. The people we met were for the most part kind and warm. But rural America is a hard place. Too often I found myself in judgement, in judgement of the powerful forces at work that make for such hardship; and, honestly, too often in judgement of the people subjected to such challenges. I was a blue traveler in a red country. And what to make of that? Smile. Say thank you. Be pleasant. Listen well. Look a person in the eye. The web of existence links us all. I wish to remember and better practice that. The action of no action. We’d been camping in the Laguna Mountains for a few days and had the place to ourselves. We had no internet and no cell coverage. Our days were lazy and we filled them with books, walks, and the occasional nap. Breaking the habit of connectivity is difficult and a thing probably best experienced only when forced on you. Like many habits, it takes time to break the back of it but is worth it if you can manage. I spent a good bit of time photographing the Acorn Woodpecker. Sibley says to “Note clownish face pattern, red crown…” and so on. Clownish indeed, with a bold yellow cheek, a bright eye ring, and a white forehead patch. They were in abundance in the field in front of us, a field of less than a dozen trees, half of which were dead. I took a biology class in college, the final project of which was to write a report of long-term observation on a patch of ground we’d chosen, a spit of earth three feet square. We had to log so many hours–I don’t recall exactly how many–and share what we observed. The project taught me many things, all of them unexpected, the greatest of which was the power of simply being still. Being still is not a thing we often experience, nor does it warrant much currency in modern society. Yet the simple action of no action can be quite something, boarding on profound even. There was perhaps an hour before the sun would set behind the ridge. (A fist held to the horizon represents about an hour, two fists between horizon and the sun and you’re looking at about two hours before sunset.) Once the sun disappeared the temperatures dropped and darkness spread across the valley faster than you could out walk it–at lease it seemed that way. I had been standing for perhaps an hour, not moving. I focused on the birds and attempted to better hear the sounds surrounding me. I concentrated on simply being still and observing. Once years ago while meditating in a woods, seated on a stump, a white-tail deer approached, sniffing the air curiously, nostrils flaring. Closer and closer she drew, then, with a shift of wind, she leaped as if suddenly released by gravity and bolted off across a meadow. When you sit in a forest things happen. On this afternoon, camera resting on my tripod in front of me, my hearing turned ever so effortlessly into listening. It is a subtle difference, hearing and listening, and I cannot say when it directly turned. You can’t really pinpoint such a thing. There was a chirping in the tree in front of me. It had been there but I’d not listened to it. I lifted my eyes and from a bore-hole the head of a fledgling appeared. It looked around, up and down, then hopped from the hole to a branch. Suddenly mom and dad woodpecker dropped from the sky screaming. They reprimanded the youngster and ushered him back into the nest. I could only imagine the discussion over dinner that night. Despite my well documented appreciation of Thoreau and his fellow Transcendentalists, I have never been able to truly nurture an appreciation for things metaphysical, spiritual, or transcendental. Yet, as I grow older and as my stubbornness yields to experience, I find peace in considering such things. There is no conclusion to draw from that, other than the lesson of stillness and the woodpecker. There was a surprising number of people at the trailhead this Christmas morning. Some of them wished me a Merry Christmas, which I returned. A few simply nodded and smiled. It was a beautiful morning, crisp and clear. Yesterday’s rain in the valley dropped as snow in the Catalina’s in front of me. These are rugged mountains, not particularly tall, but jagged and naked. Over the ridge is a Bighorn sheep refuge and dogs are not allowed. So Lucy and I kept just shy of that. I had her tethered to me by a rope I’d stowed in the truck. I’ve kept her leashed in this manner since coyotes paraded through camp two days ago, heads down, eyes glancing here and there, totally insolent and bold. It’s a long rope and she gets to sprint every so often, as is her nature, while I have the comfort of keeping her safe. A month or two ago, it was in Colorado, I think, she was off leash and lost to my sight when I saw a big eight-point buck come storming out of a little copse of woods down by the water. Lucy was giving chase. She was easy to spot, a little black dog against the white field of snow. The buck wisely headed up hill and Lucy’s short legs soon gave out on her. She has the heart of a giant but the body of a simple dog. I’ve had dogs all my life and I’ve written about them here plenty. Where it not for my dogs I would probably not have the morning walks. It’s as simple as that. And my morning walks are close to a fashion of prayer for me. I guess, if logic holds, my dogs have been personal prophets, pointing a way, sparking a thought, instilling wonder. Before Lucy was Maggie, and before her, Cleo, and Punkin before that–all assured of my morning attention, thankfully. Emerson said of Thoreau that his thought and writing was in direct proportion to the length of his daily walk. Thoreau himself claimed a need of at least four hours of sauntering. He called it sauntering which I particularly appreciate. He did not need a dog to make him get up and get going, but then he was a different type of human being altogether. Me, I prefer the companionship of my dog. I am never far from the thought that they, my beloved canines, are rushing through life by a factor of seven. Such future sadness is, for me, a motivation to remember each morning and moment. Two mornings ago I hiked up to ruins left behind by the indigenous people of this valley fifteen hundred years ago. When the sun crested the ridge the plateau came alive. Birds sang around me. The sun suddenly warmed to the point I took off my down jacket. The morning light turned from steel grey to warm amber. I don’t go to church but if I did it would have to be like this, out of doors and without doctrine, pure and undefiled. These people, the ones who existed here, I’m told, had to make multiple trips down to the valley each day to get water and forage for food. I’m sure their existence was hard and my morning ritual would have been lost on them. Modern existence is not without challenges but the rudiments of existence, for most us, have been addressed and for that I am grateful. Merry Christmas, friends. If you look deep enough you might find mixed into that basket of core beliefs you carry around the notion of home, at least that has been my recent experience. Home: a place of retreat, a safe and stable place, ideally a place of comfort. With less than one week before our departure we have emptied the house of all personal belongings except those we’re bringing with us on the road. Home as place, as an abode, has been self-consciously stripped from us. Truth be told, it’s a bit unsettling. I like that the Old Norse word for home, “heimr,” carries the meaning of residence, but is also the word for world. That seems especially fitting right now. This notion seems to have settled on me with more import than on Carole. Recently, while discussing this with friends, she turned to me and said, “My home is wherever you are.” It was perhaps the sweetest thing she has ever said to me. “And besides, we’ll be towing our physical home behind us.” I can always count on her basic wisdom to set me on the right course. This is an except from a recent essay published at Black Lamb. Click here if you wish to read more. As noted elsewhere, we’ve rented out our home here in Portland and will be living a full-time nomadic existence for the forseeable future. I’ll be documenting the adventure at our blog, The Airstream Diaries. Please check it out and subscribe if you’d like to follow our ramblings. Thanks. Tallinn, Estonia. A week ago our bag was stolen in Amsterdam. We were standing outside the city-center train station, foggy after a transatlantic flight, hungry and disoriented. I stood post with our bags. Carole, Tim, and Candace huddled over the map, occasionally glancing up at the street sign. A man approached and asked for directions. That should have been warning enough, as if I had a look of the local about me. I responded that the train station was directly behind me. He nodded and moved on. A second man appeared. I had not noticed him before. He locked eyes on me. I stared at him briefly, then he too moved on. He did not smile. The men disappeared into the crowd. My senses returned and I looked down to discover that one luggage bag had disappeared as well. I wonder, if at night in their lair, thieves harbor misgivings at having troubled their victim? Will they use the shampoo they pinched? Will they sell Carole’s curling iron, or simply toss it aside in their futile search for pearls and diamonds? Are thieves, by definition of personality, lacking the introspection necessary to feel remorse? I doubt it. More likely, circumstances demand that they ignore such sentiment. Like the rest of us, they have to eat too. Most times I worry that the world is lurching along this path of desensitized behavior, particularly with relation to the physical world, the environment: What can I salvage, rather than how can I contribute? Personally, too often I discover myself looking to see what can be secured, rather than conserved. We are all, to a fashion, practicing thieves. Lucy and I have resumed our morning walks after several months of doing without. 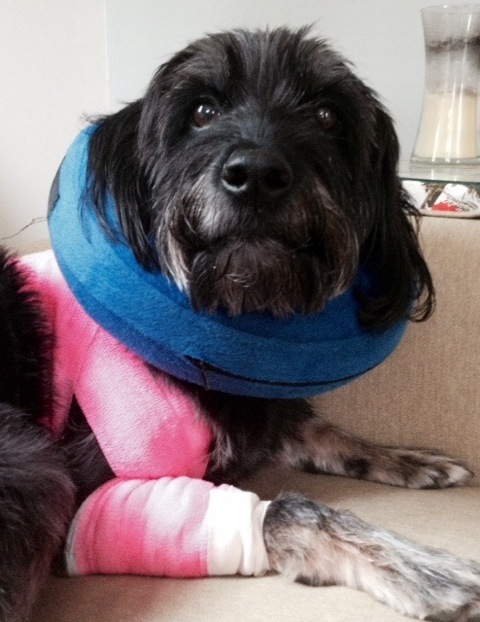 Last Fall, during a walk, she limped out of the woods, her shoulder lacerated, obviously the result of running into something. Despite two operations we could not get the gash closed and had no option but to wait it out. We applied raw honey to the wound, kept it clean, didn’t let her run and so forth. Eventually she healed. We are back to our schedule but she is considerably more cautious, and avoids that part of the woods. I keep a closer eye on her as well. A morning walk has been part of my life for as long as I can remember. Now that I’m back at it I have a greater appreciation of the benefits to starting my day in this fashion. It is likely not a coincidence that, after resuming the routine, I am writing this and that I wrote a post last week about, indeed, the morning walk. The creative benefits of walking are well documented. “I have met with but one or two persons in the course of my life who understood the art of Walking, that is, of taking walks—who had a genius, so to speak, for sauntering….” wrote Thoreau. I have no genius for anything, but if I did, having it for the art of sauntering would be welcome. We leave this evening for Europe: Amsterdam, Copenhagen, Tallinn, St. Petersburg. Sixteen days. Whereas Carole has been concentrating on which clothes to pack, I have been thinking about what books to bring. This disparity does not frustrate either of us. After 35 years there are no surprises and few tensions. I am bringing Lily King‘s new novel, Euphoria. There is no compliment of activities like a good novel married to new travels. 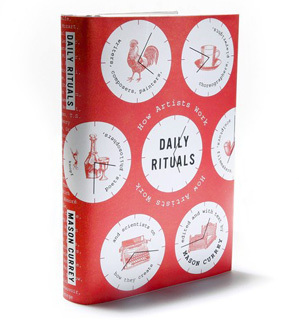 But feeling decidedly in need of self improvement, I’m bringing along a book my friend Thatcher recommended, Daily Rituals, How Artists Work. Opening randomly, I find the chapter on Sartre, “‘One can be very fertile without having to work too much,’ Sartre once said. ‘Three hours in the morning, three hours in the evening. This is my only rule. '” Continuing the march to be a better self, I’m also bringing along Alain De Botton‘s, How Proust Can Change Your Life. (Jacket blurb from the NY Times: “A self-help manual for the intelligent person.”) I like to travel with books and feel no guilt about taking time to read them while on the road. (Indeed, I find guilt to be a generally useless and tiresome emotion and rarely invest in it.) Reading a book while in a foreign country, like seeing a movie with subtitles, enhances the experience. Thinking on Thoreau above, the ability to consistently “enhance experience” is a genius I aspire to.